Egerton Lodge is a delightful early Victorian house standing in an elevated position surrounded by the privacy of well stocked gardens. It has the benefit of an attractive annexe converted from a former coach house, being ideal for guest accommodation or potential holiday let.The house has well-presented accommodation combining period features with modern day comfort including an extension to the rear, designed by Graham Moss, creating a light and attractive kitchen/breakfast room. There are two elegant reception rooms with high ceilings and decorative coving. Of particular note is the duel aspect drawing room with open fire and there is a dining room with bay window. A welcoming family room with wood burning stove adjoins the kitchen, both enjoying views over the garden. A door opens to steps down to the extensive cellar, suitable for workshop and storage.A cloakroom and utility room with direct access to the garden completes the ground floor accommodation.AnnexeAdjacent to the main house is a recently converted former coach house now offering a contemporary living space with an open plan sitting room with French windows opening to the garden, kitchen and dining area, shower room and steps leading up to a galleried double bedroom. This attractive, light and adaptable living space is ideal for secondary accommodation, holiday let, gym or home office.The original staircase with mahogany hand rail leads up to the well-lit galleried landing off which is the master bedroom with a spacious en suite bathroom along with four further bedrooms and a family bathroom. The fifth bedroom presently serves as study with built in storage. Space saver stairs lead up to an attic room. 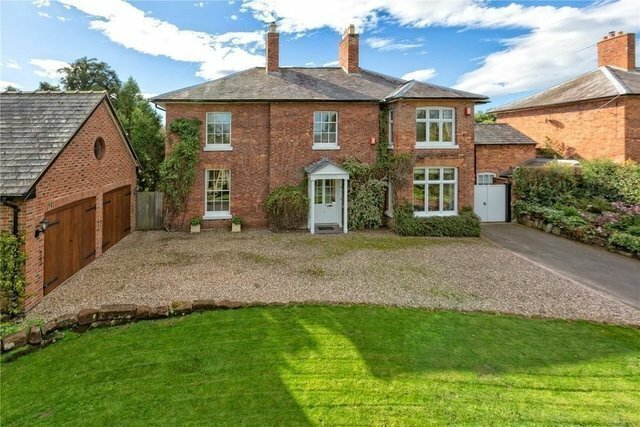 OutsideThe house is set back behind established hedging and approached up a driveway leading to a gravel parking area to the front of the house and to the substantial detached double garage beyond. There are lawned gardens to the both the front and rear of the house with well stocked borders and attractive seating areas.